Jared Diamond. 2005. Viking Penguin, New York. 592 pages. Matthew R. Simmons. 2005. John Wiley & Sons, Inc., Hoboken, New Jersey. 448 pages. Peter W. Huber and Mark P. Mills. 2005. Basic Books, Perseus Books Group, New York. 214 pages. It is an unfortunate truth that in aviation as in human history, we learn the most from the mistakes for which others have paid dearly. Sometimes, as in the case of the July 2000 Concorde crash outside Paris, one miscue leads to disaster that marks the end of an era. During its takeoff roll, the aircraft’s front tire came apart when it struck a piece of metal on the runway. Tire debris hit the left wing, rupturing a fuel tank. The warning from the control tower that flames had erupted from the speeding aircraft came too late. Already past the point of decision and committed to takeoff, the captain eased the control yoke back and the aircraft lifted into the air. But once airborne, engine numbers one and two failed. The aircraft began a slow roll to the left from which it was later concluded it couldn’t possibly have recovered. The flight, which had been intended to cross the Atlantic in less than four hours, was airborne for less than 90 seconds. The harrowing nature of such tragedies serves as the framework for a broader discussion: Is modern civilization also following a potentially short flight path? Three recent books have sought to provide insight into the answer. Like an investigator at an accident site, Jared Diamond sifts through the history of lost human civilizations for clues to the cause of their extinctions in Collapse: How Societies Choose to Fail or Succeed. Examining several “flight paths” for common threads, the UCLA professor of geography and physiology creates profiles of once powerful and successful peoples from across the globe: the Norse in Greenland, the Maya in Central America, the Easter Islanders in the eastern Pacific and the Anasazi of southwestern North America, among others. He warns that we must not ignore the factors responsible for past collapse. Diamond summarizes those factors in a surprisingly simple checklist: climate change, hostile neighbors, trade relationships and environmental damage. These provide a measure of a society’s interaction with its surroundings. Just as the airline pilot must interpret raw information from his instruments, the interaction of these collapse indicators must be understood and properly interpreted. Although each of the four factors has played a varying role in past collapses, a fifth and most telling variable is key: how the people of a society responded to what they saw happening around them. Diamond concludes that as we continue to rev the growth of the world economy, we are pushing the gauges to their red lines, traveling a course that cannot be maintained. He believes the four historical problems are being pushed to new and interconnected levels. Because these are now global issues, he warns that it is no longer acceptable to ignore what happens outside our local arena. To believe that first class has no relationship to economy class is erroneous. We all ride together. Diamond’s most powerful insight is that these are problems of human relationships first, not simply problems of affluence, waste and pollution. Unfortunately, habitual optimism often skews our perception of what is occurring around us. We are prone to ignore danger signs around the globe and give little attention to the indicators Diamond describes; they seem disconnected from everyday life. Until gasoline and utility bills are suddenly eating great holes in our personal budgets, factors that account for these shifts are off our radar screen. 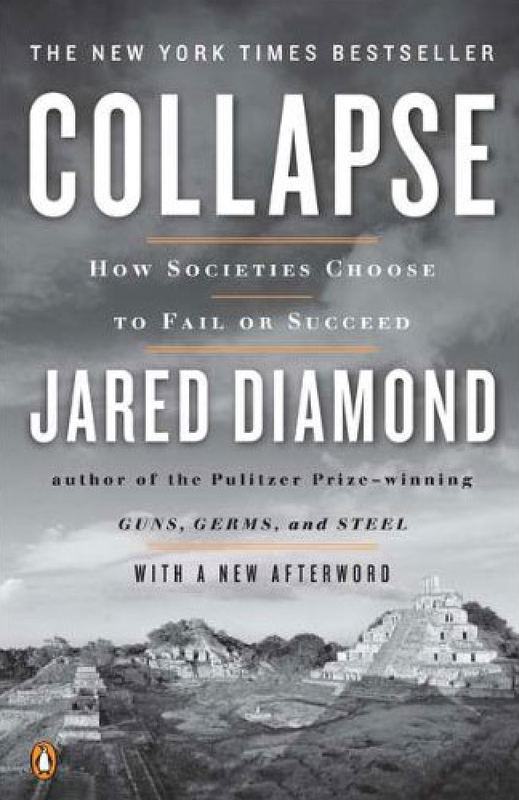 Diamond admits that it’s easy to be blindsided, pointing out that the leaders of collapsed societies often failed to anticipate trouble ahead or even to recognize disaster when it was at their very doorstep. And now as then, those in positions of influence often selfishly opt to continue the suspect activities for their own gain. Those who are “highly motivated by the prospect of reaping big, certain, and immediate profits, while the losses are spread over large numbers of individuals,” turn a blind eye to the larger consequences of their actions. “The losers in this equation have “little motivation to go to the hassle of fighting back, because each loser loses only a little and would receive only small, uncertain, distant profits even from successfully undoing the minority’s grab.” While Diamond calls such behavior “morally reprehensible,” this scenario continues to repeat itself in the acquisition of resources around the globe. Clearly one of the modern world’s most important resources is oil. The International Energy Agency (IEA) 2005 World Energy Report predicts that global energy needs will be 50 percent higher in 2030, with 80 percent of that increase to be met by fossil fuels. As demand surges, the IEA believes that Saudi Arabia, “which has the largest proven reserves of oil in the world, will remain by far the largest supplier.” It is expected that in 2030, Saudi Arabia will continue to account for about 36 percent of the Middle East’s oil output. 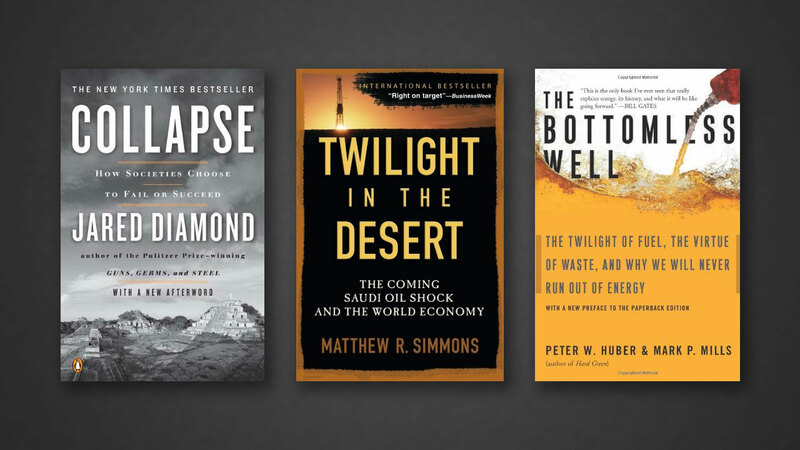 Providing a contrasting argument, Matthew Simmons is unequivocal that “the preponderance of technical information in the technical papers” reveals the Saudi oil miracle to be on the verge of collapse. 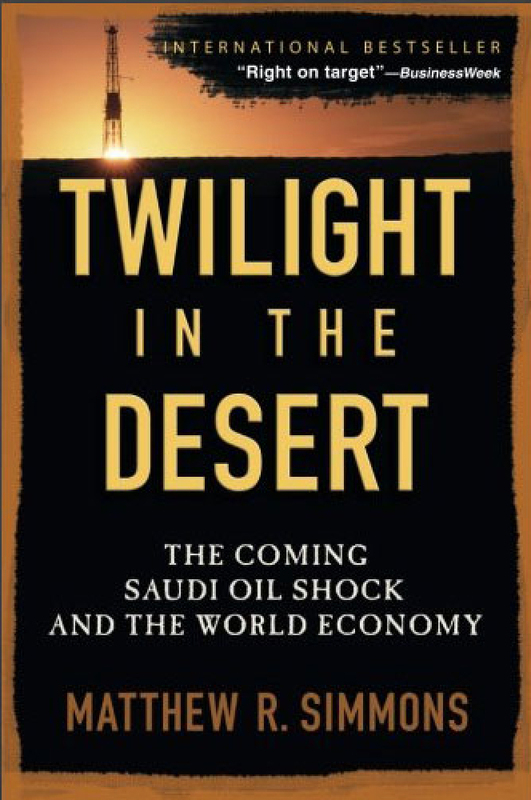 Based on a careful evaluation of Society of Petroleum Engineers records, his Twilight in the Desert: The Coming Saudi Oil Shock and the World Economy suggests that there will be a great deal of armrest clutching when the Saudi production level is no longer attainable. Certainly since 1970 and the peak of U.S. oil production, Saudi Arabia has dutifully “topped off the tank,” ensuring that world production has always met consumption demands. For decades prior to the ’70s, oil prices had remained between one and three dollars a barrel. But by that time, low prices had so undervalued oil that demand was out of control; oil exploration projects and the corporations that bankrolled them were on the verge of bankruptcy. According to Simmons and the U.S. Senate hearings he cites, Aramco and its American investors were destroying its oil fields through overproduction. “The culprit that caused oil prices to jump by a factor of four to six was not King Faisal’s brief oil embargo,” Simmons asserts. In fact, he believes the 1973 embargo inadvertently saved the situation. “The real villain was the evaporation of spare oil capacity while global demand had become a proverbial runaway train barreling down a steep track.” Even with prices rising, oil demand continued to increase. North Sea and Alaskan oil, now viable under the new pricing regime, covered much of the demand, but Saudi oil continued to provide the cushion. Simmons sees a similar situation today as world oil demand pushes production to its quivering limits. With Saudi Arabia continuing to control the world’s swing oil production—meaning the ability to add millions of barrels to the world oil pool when necessary—the potential impact of a Saudi collapse is greater than ever. As the IEA admits as well, “uncertainties about just how big reserves are and the true costs of developing them are casting shadows over the oil market outlook and heightening fears of higher costs and prices in future.” If Simmons is correct, the social and economic systems we have created will be in trouble, on the verge of a collapse of our own making without a measured plan to move away from our current dependence on oil. Today’s interconnected and economically integrated globe seems to require that such a “Plan B”, as Simmons calls it, must encompass all nations to be effective. International disagreements over economic growth and carbon dioxide emissions (the Kyoto Treaty) and marine fishery restoration are not hopeful indicators. Creating a universal solution based on international agreements therefore seems doubtful. The desire to “get for self” in time of limits or crisis seems to trump any sense of equity and the legitimacy of others’ needs. Without global cooperation, the horror of resource wars seems inevitable. The specter of long-term reliance on short-term resources haunts both the proponents and the gadflies of economic growth. Yet growth continues: consumer demand drives supply, and suppliers are content to fan ever greater demand. If these writers were load planners—the technicians who understand an aircraft’s center of gravity and conditions of balanced flight—there would be no restrictions on freight and passenger baggage at all! 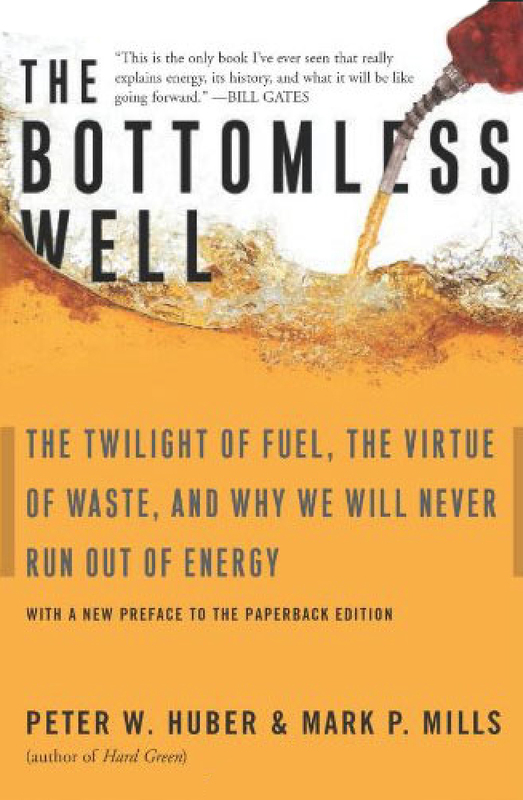 Their seven-point argument is firmly rooted in the belief that energy is infinite, and that both civilization’s and the environment’s best hope rests in our increasingly sophisticated use of energy. Just as a kerosene-burning aircraft engine is more efficient than a coal-fired train, which in turn is more efficient than a biomass-fueled horse and carriage, a civilization that can shift its broader energy dependence from carbohydrates to hydrocarbons and finally to nuclear- or solar-based electrical generation is on its way to sustainability. Huber and Mills call this a transition of “power density”: more power in less space. The fact that electricity is more expensive than fuel is irrelevant; it is the work that can be done with the electricity that is important. But to manufacture this power requires power. As we come to accept this truth, rather than remaining our enemy, the laws of thermodynamics will become our ally as we partner with them to create increasingly refined and productive power. This purification of energy is a hungry process, described by the authors as a pyramid. “Only about 2 percent of the energy that starts out in an oil pool 2 miles under the Gulf of Mexico ends up propelling 200 pounds of mom-and-the-kids—the ultimate payload—2 miles to the soccer field.” The rest is consumed in the process of refining and delivering that tiny bit of high-grade power. But the law that “energy thus consumes itself at every stage of its own production and conversion” does not stymie civilization. On the contrary, at the end of the process we have created a highly ordered energy supply to power our modern technologies. One cannot run a computer on steam power unless that steam has spun a turbine to create electricity. The unfortunate reality is that the world and the physical and economic connections we have created are not an easily understood “mechanism.” The checklist for success cannot be as easily summarized as Captain Bradley’s: “Look for something that won’t let it fly; know which lights to ignore and which ones mean ‘Stop!’” Are we surrounded by warnings of impending catastrophe—environmental damage, depletion of vital fuels, political unrest, technology that costs more than it benefits? Are we trailing flames? Or was that just a bump on the path to a better tomorrow? Today the remaining Concordes are museum pieces; relics of an optimistic time in aviation that did not advance as expected. For 30 years the intricate machines were the pride of the fleet for both British Airways and Air France. But they were found to be surprisingly fragile. Finally, declared too costly, they were retired. They remind us that many things we take for granted are in reality quite tenuous. In similar fashion, these three books confirm our present civilization to be a world on the edge, teetering between obsolescence and renewal, sustained flight or shuddering stall. Scientific and technological advances have given us new tools to evaluate our flight attitude. We have chosen to debate, reinterpret or ignore many of these tools altogether while powering to new altitudes. Collectively these authors show that many decisions still remain to be made—decisions that will ultimately determine the comfort as well as the duration of our civilization’s flight. Fasten your seat belt.